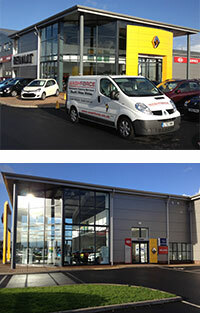 Welcome to Washforce Harpenden. We offer a huge variety of professional cleaning services catering to both local residents and the Harpenden business community. Whether it’s your windows that need washing, a conservatory cleaning or a gutter that needs clearing, your local Washforce representative is happy to help! Equipped with state-of-the-art equipment and a can-do attitude that’s oh-so-typical of the national brand we represents, look no further than your local Washforce technician for an unparalleled property wash experience! With storms and rainfall a-plenty channelling sediment and loose leaves into the gutters of Harpenden’s homes, it’s no surprise that gutters become clogged and in need of treatment during the winter months. So if you feel that your gutters may be in need of a clean, look no further than your Washforce’s local representative! Washforce will provide you with a comprehensive gutter clearance service, using authorised products, reviewed against the strict guidelines we set ourselves as a quality brand. Call today for an initial quote on 0203 0260 886…gutter clearance expertise is only a phone call away! As expected, window washing is a core service that we provide…and indeed remains the service for which Washforce built its stellar reputation in Harpenden area. However, despite this achievement you won’t find a smidgen of complacency in the work of your local Harpenden Washforce window washer. Combining the latest window washing equipment and techniques with a will to graft and a professional approach , we won’t leave you wanting!